The National Disaster Coordinating Council (NDCC) on Monday recommended the possible evacuation of more than 15,000 families along radius of Mayon Volcano in Albay if the volcanic activity worsened in the next few days. In the statement released by NDCC Administrator Retired Maj. Gen. Glenn Rabonza, the primary objective of the Provincial Disaster Coordinating Council (PDCC) of Albay led by Gov. Joey Salceda is to have zero casualties once the situation of the volcano worsens even more. The Alert Level 2 raised by the Philippine Institute of Volcanology and Seismology (PHIVOLCS) in still in effect. According to plan submitted by the PDCC-Albay, once the alert level is raised to level 3, around 1,785 families living inside the six kilometer radius permanent danger zone will be immediately evacuated by the provincial government. These include some barangays in the cities Tabaco and Ligao, and Municipalities of Camalig, Malilipot, Guinobatan and Daraga. Governor Salceda instructed disaster officers in those said cities and municipalities to update their data on population at risk and their respective warning and evacuation plans for the Provincial Disaster Office to make necessary adjustments in its contingency plans which calls for immediate evacuation of the affected residents when Alert Level 3 is raised. Meanwhile, around 13,458 families are ready to evacuate along the 8-kilometer extended High Risk Zone if the alert level will reach level 4. The PHIVOLCS and some local officials of Albay yesterday conducted and aerial survey to determine the present status of the volcanic activity of Mayon. Salceda warned around 4,000 farmers who were keeping watch over crops within the permanent danger zone to return to their villages at night to avoid getting caught by surprise should the volcano erupt. Human activity near the volcano is already prohibited after PHIVOLCS raised the alert level from 1 to 2 last Friday after an increase in abnormal activity in the past days. From literature to the Big Screen, the fascination with the planet Mars has taken many forms. In the geology department at Mercyhurst College, that attraction currently surrounds three of the planet's oldest and most explosive volcanoes known as highland paterae. These distinctive landforms will be studied extensively by a team of faculty and student researchers this summer, thanks to a $137,000 NASA grant awarded to Dr. Nicholas Lang, first-year assistant professor of geology at Mercyhurst. "The purpose of the study is to increase our understanding of this unique and early style of volcanic activity on Mars, which we hope will provide us with a greater understanding of the history of the planet," Lang said. Unlike volcanoes in Hawaii and many of the volcanoes on Mars known for effusive, or gentle, eruptions, the morphology of the now extinct highland paterae - which have a large central caldera and extensively channeled and ash-covered flanks – suggests a history of enormous explosions. That explosive activity, Lang said, may have implications for water sources on Mars. Mars' atmosphere is now too thin and its temperature too cold to allow liquid water, but that may not always have been the case. At one time, Mars may have had extensive amounts of surface water and groundwater that may have shaped the topography that now exists on the planet, particularly the chaotic-looking terrain that surrounds some highland paterae. Lang said the interaction of basaltic magma at the site of highland paterae, when mixed with water, could have intensified the volcanoes' eruptions. Further, he noted, "When you put volatiles into the atmosphere, you have to consider what impact that may have on a planet. Some think the early conditions of Mars were more Earth-like in terms of pressure and temperature conditions. What happened?" Lang and his students will do their part to discover more about the history of the planet by collecting and analyzing available data, mostly accessed online, from high-resolution spacecraft images. "This is an opportunity for our students to get involved in frontline research and contribute to advances in the field of Mars' research," Lang said. "It also enables them to develop valuable research skills that will be crucial to their pursuit of graduate school and career placement." Mayon volcano displays some activity which concerns experts! Mayon Volcano in the Philippines with Legazpi City in the foreground. Mayon, one of the most active volcanoes in the Philippines, is causing concern due to increasing signs of activity. Renato Solidum, the director of PHIVOLCS (Philippine Institute of Volcanology and Seismology), said that there has been increasing seismic activity and "glow" at the summit of the volcano near (~20 miles / 45 km) Legazpi City. However, even after this sense of increasing activity, the alert level (1) has not changed, but local residents were altered to the new activity. This means that there is low-level unrest with slight increase in seismicity. The last notable eruption in 2006 at Mayon (oddly called a "silent eruption" in the linked article) produced a lava flow. There were also minor phreatic explosions in 2008. The Alaska Volcano Observatory yesterday downgraded the aviation warning code for Mount Redoubt from orange to yellow and the alert level from Watch to Advisory. Alert levels had been high since Mount Redoubt’s most recent rumblings starting March 15. The most dramatic eruptions happened between March 22 and April 4 when the volcano spewed ash, gas and steam up to 65,000 feet high. High level winds carried ash to Talkeetna, Skwentna and Trapper Creek while air traffic came to a halt for a few days. After April 4, Redoubt continued to erupt, creating a lava dome in the summit crater. A lava flow now extends nearly 0.6 mile down the north flank of the volcano. AVO reports that observations from overflights, webcam and satellite imagery have not been able to detect changes caused by dome growth for the past three weeks. However, the dome is unstable and AVO scientists warn that a collapse could be accompanied by the production of a large ash plume in the Drift River valley. Lava flow has slowed significantly and may even have stopped, prompting AVO to downgrade the aviation color code to yellow and the alert level to advisory. Advisory means that volcanic activity has decreased but continues to be closely monitored for possible renewed increase. Seismic activity slowed down as well, but is still higher than normal. AVO had staff monitoring Redoubt around the clock, but now transitions employees off the 24/7 shifts. Volcanic eruptions creating unusual sunsets? I’ll have to keep an eye on the sky today as the sun sets. Spaceweather.com notes that people have been reporting unusual sunsets, possible the result of the June 12 eruption of Russia's Sarychev Peak volcano. The eruption sent plumes of sulfur dioxide and other debris into the atmosphere, which spread to the United States and Europe. The result has been delicate ripples of white over the western horizon. Then, as the twilight deepens, the sky turns a shade of lavender. Has anyone in the Crossroads area noticed the unusual sunsets? Mount Cleveland, located in the eastern Aleutian Islands near the community of Nikolski, erupted Thursday morning sending an ash cloud less than 15,000 feet in the air. According to the Alaska Volcano Observatory, the ash cloud detached from the volcano and moved south. Cleveland last erupted in February, 2001. Three explosive events sent ash plumes to as high as 39,000 feet. AVO elevated the alert level for the volcano located about 940 miles southwest of Anchorage to orange. Mud volcano is bad news for the area! Scientists observing Indonesia's infamous mud volcano in heavily-populated East Java say the eruption could continue to be active for another thirty years and threaten around 100,000 people in the area. Geologist Mark Tingay, from Curtin University, in Western Australia said the destructive mud-spewing volcano, which last erupted in 2006 killing 14 and displacing 40,000 people. 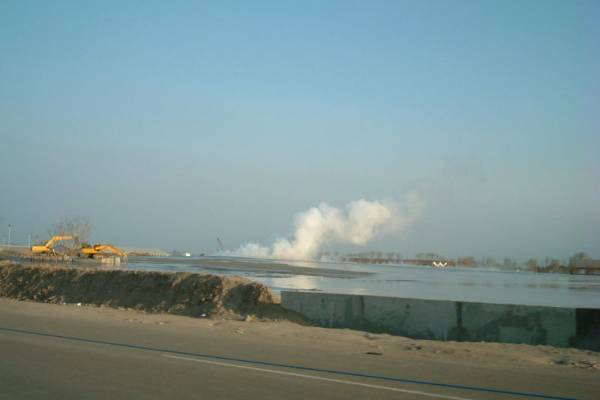 “Early in the morning of 29 May 2006, hot mud erupted from the ground in the densely populated Porong District of Sidoarjo. With initial flow rates of around 5000 cubic metres per day, the mud quickly inundated the area,” he said. The volcano continues to spew out 100,000 cubic metres (or 50 Olympic-sized swimming pools) of scalding hot mud each day, according to a Geological Society Australia news release. He added the people in the surrounding villages remain threatened as the eruption gains in strength. “Since then, the so-called Lusi eruption has increased in strength, expelling over 100,000,000 cubic metres of mud at flow-rates of up to 170,000 cubic metres per day. The mud—which is now being prevented from spreading outwards by hastily erected walls—has covered over 7 square kilometres of land at depths (so far) of up to 30 metres," he said. He said thousands had lost their homes and warned that many more faced calamity if the eruption continues. To date the estimated cost of damage caused by the volcano is $4.9 billion. Dr Tingay is part of an international team formed as part of the international disaster relief effort. Flights cancelled due to volcanic eruption! A remote volcano in the North Pacific is playing havoc with flights between Vancouver and Asia, as Air Canada, Air China, Asiana Airlines and Korean Airlines all cancelled or delayed flights in and out of Vancouver International Airport on Tuesday. The Sarychev Peak, on Russia's central Kuril Islands, began belching plumes of ash and smoke high into the atmosphere on June 12 and airlines are taking no chances flying through the gritty residue. Anyone travelling between Vancouver and Tokyo, Seoul, Beijing, Shanghai and Hong Kong is urged to check with their airline before heading to the airport. According to NASA, the ash plume from the eruption reached an altitude somewhere between eight and 16.5 kilometres above sea level, leaving a brown mass of volcanic ash more than 50 kilometres in diameter. Giant underwater volcano attracts scientists' attention! The under-water volcano Columbus, situated 6,5 meters south-east of Santorini in the Aegean sea, is being observed with great interest by Greek and German scientists. The have registered constant earthquakes of 4 Richter, hot air eruptions and continuous changes in the sea floor around the crater. The volcano is 470 meters high and reaches down to 17 meters beneath the sea floor. Its crater’s width is out of proportion- 1.5 kilometers. Complex submarine equipment has shown that Columbus’s volcanic activity never stops. It is the reason for the frequent earthquakes and constant changes in the surface around the crater. “The distortion of the sea floor is minor but it can be seen on the walls of the crater and in the 10-15-kilometers perimeter around it,” says Martin Heds from the Geology and Seismology institute to the Hamburg University. According to him, this does not indicate an eruption in near future. The last eruption of Columbus was in 1650. “Reservoirs” filled with hot water, reaching 200 degrees centigrade, resembling under-water fire places and releasing different kinds of gases- mostly carbon dioxide and hydrogen sulphide, were found around the volcano. Another reservoir- 5 kilometers wide is situated under the volcano, filled with magma. A liquid, boiling substance is being released by this reservoir, causing the earthquakes and the other phenomena observed by the scientists. To compare, the other volcano situated nearby is not causing any earthquakes, no release of submarine gases is observed and the gases evolving obove the sea-surface have a temperature of 17 degrees centigrade, i. e., it is in a quiet stage. Columbus is part of the Santorini volcanic center, belonging to the Volcanic group of the South Aegean, together with Susaki, Metana, Milos and Nisiros. This group appeared around 13 years ago when the north part of the African tectonic slab began submerging under Aegean sea’s slab. Colombia was shaken by 3 volcano eruptions but no evacuations were needed! Three volcano eruptions in southwest Colombia sent smoke and ash into the sky and prompted Colombian authorities to declare a red alert in the area. Authorities believe a larger eruption is imminent from the 14,000 foot Galeras volcano. It's located about 12 miles southwest of the town of Pasto. The volcano began spewing ashes Sunday and authorities have declared much of the surrounding area off limits. No evacuations have been ordered as yet. A cloud of ash 40 km. by 20 km. 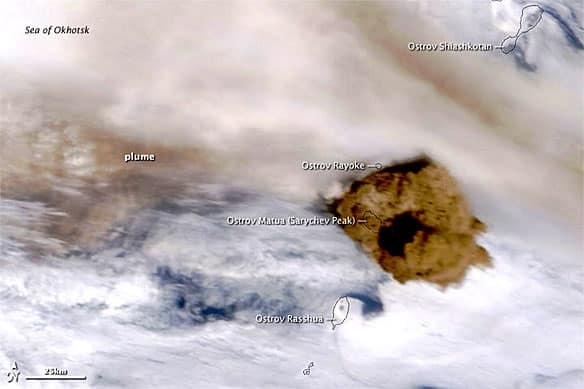 (25 x 12.5 miles) has issued from the crater of the Shiveluch volcano on the isolated Russian Kamchatka Peninsula along the Bering Sea, and the column of ash pouring from the volcano reaches 7.7 km. (4.8 miles) above sea level today, Gazeta.ru reports. The volcano is one of the most active and the northernmost of about 30 live volcanoes on the peninsula. Its eruption has been going on for more than a year, and has gained momentum in the last month and a half. More than 170 localized earthquakes have also been reported at the volcano. The nearest settlement to the volcano is the village of Klyuchi, 50 km. (31 miles) away. It has a population of 5000 and is not considered endangered by the volcano. Aviation may be disrupted by the eruption, however, RIA Novosti notes. The volcano’s ash, which may fall and cover hundreds of square kilometers in a thin layer, is an irritant to humans and animals. The last major eruption of the volcano was in 1964. It also erupted in 1980-1981, 1993-1995 and 2001-2002. Kamchatka is also the site of numerous geysers. The Galeras volcano located in southern Colombia in the vicinity of Ecuador border has erupted with 'an explosive character'. No report on possible toll or injuries has been reported so far, but the state-run Geological Mining Institute announced a high-level alert on Sunday due to the explosive feature of the volcano activities, AFP reported. Authorities are planning to send to safer places an estimated 7,000 people who live at the foot of the spewing volcano which scrapes the sky to an altitude of 4,270 meters (14,029 feet). A 1993 eruption of Galeras killed nine people, including six scientists who had descended its crater to take gas samples. Underwater volcanic eruptions witnessed first hand! A crack team of "rapid response" volcano experts scrambled to the South Pacific Ocean last month to find something rarely seen by human eyes: an underwater eruption exploding into the inky, cold depths and spewing lava onto the ocean floor. The realm of underwater volcanic eruptions is a strange, uncharted one. As much as 80 percent of the planet's volcanic activity is thought to occur on the sea floor, but scientists are rarely able to witness the events. One of the few other undersea volcanoes recorded by researchers was when a series of eruptions near the island of Guam in 2004 vented droplets of liquid carbon dioxide and formed pools of liquid sulfur. Last November, a team led by Joseph Resing of the National Oceanic and Atmospheric Administration's Pacific Marine Environmental Laboratory in Seattle detected a plume of volcanic material floating in the water column, above the Lau Basin, 140 miles southwest of Samoa. On May 6 they returned and sent the remotely operated vehicle (ROV) Jason-2 into the abyss, wondering if the fiery theater was still going. It was. The team saw glowing, red-hot lava creeping out of a vent called Hades on the West Mata volcano, nearly 4,000 feet under water. Ocean water chills lava on contact, forming pillow-shaped rocks that are commonly found on land, but that no one had ever witnessed growing on the ocean floor. Mount Slamet in Central Java has been showing increasing volcanic activity in the last month, as it continues to erupt and spew lava and hot ash into the air. An official monitoring the volcano, Luruh Nurkholis, told tempointeraktif.com he logged 60 eruptions on Wednesday night. He recorded lava sprays, reaching between 50 to 700 meters high above the summit, during night monitoring at a post in Gambuhanm Pemalang. The alert status for the volcano has been at the second highest level since last month. The Volcanology and Geological Disaster Mitigation Center (PVMBG) has recommended five regental administrations in Central Java distribute facemasks in anticipation of the spewing of thick ash from the rumbling volcano. The recommendation to the five regencies — Banyumas, Purbalingga, Pemalang, Tegal and Brebes — was made after the seismic activity of the volcano, which has begun spewing thick ash and molten lava from its crater, increased intensively.